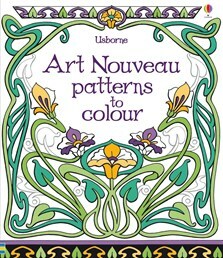 Explore the beautiful, flowing designs of the Art Nouveau era in this gorgeous book full of stylish patterns to colour. Patterns to colour include those found in Nouveau fashion, ceramics and buildings, as well as vintage advertisements and jewellery. Each pattern is accompanied by information about the decorative arts produced around the turn of the nineteenth century, including the work of famous designers such as Macintosh, Tiffany and Lalique.